You may also want to create a new account using the name of the person who is going to get the machine, if you know it. Select Logout from the Apple menu. After you see the logon screen, click the new account name and enter the password you just created. 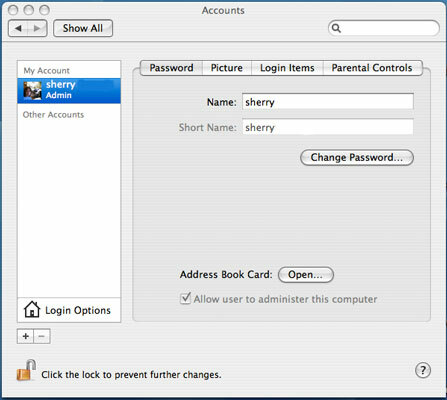 Again, select System Preferences from the Apple menu and click the Accounts icon. Click the Lock icon. Go to your new computer. On your new computer, triple-check that all the files for all accounts on the old machine have been transferred. This is your last chance to copy these files to your new computer. Back on the old machine, delete each account, except the one you just created, by clicking the old account’s icon and then clicking the minus button. Confirm that you really want to erase everything, with no extra copy. Just an FYI: This step can take a while. Delete any applications you don’t want to transfer from the Applications folder. Double-click your hard drive icon. If any of your files have leaked into this top-level directory, drag them to the Trash. Choose Finder→Empty Trash. Regardless of whether you rebuilt OS X from scratch or deleted accounts, your files are not necessarily gone yet. To obliterate them permanently, erase the free space on your hard drive. To do this, select your hard drive and click/select the Erase Free Space button. Then select the 7-pass method. Note that this takes several hours (overnight).